Most of the drawings here derive from my Thursday life-drawing sessions. 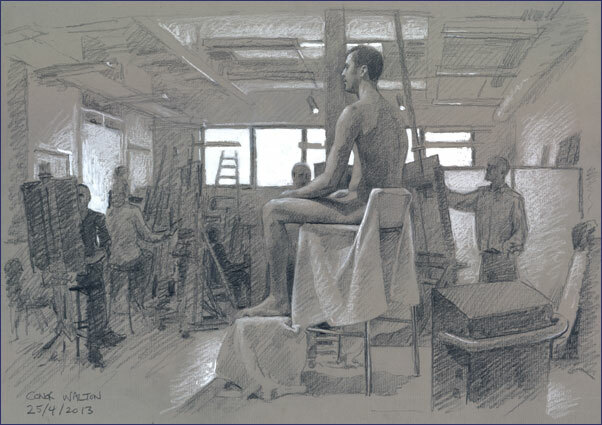 For the last fifteen years I’ve been part of a group of Irish artists that get together each Thursday to renew their drawing skills, sharing the cost of a live model. Working communally in this way results in work with a particular ethic and aesthetic. When I paint I usually work alone in my studio, where I exercise, as far as I can, complete control over every aspect of the work in order to achieve my aims, the chief among these being a personal significance—a meaning. But when I join my friends to draw the model, I have, by and large, to accept what I find: a pose of limited duration, a particular light, a space to work in, a collective mood. What emerges is less controlled, perhaps less deliberate than most of my studio work, but often more spontaneous, more natural. Accepting what is before me as a fait accompli, I seek to allow my drawings manifest the same quality; to have the authority of simple truthfulness, and the inevitability of fact. Working without colour, without photographic aids and with a limited time to complete the work pushes me to explore the limits of my means. I only have line and tone, but there are so many different kinds of lines! So many different weights and vibrations of tone! The essence of drawing is abbreviated description of form. But I’ve only discovered how to abbreviate—what I can get away with—by improvising; trying to get the whole down with what, on the face of it, are completely inadequate means. This process of improvised decision and discovery is deeply personal. It is the crucible from which an artist’s unique calligraphy and sense of style emerges in essence. That is why artists often value drawings more than ‘finished’ works. The whole drawing becomes a sort of improvised, unrepeatable performance. It expresses, above all, the simple joy of looking and the blissful immediacy of the moment.